You have three months get your entry ready because the deadline for entries is noon on Friday 23 February 2018. 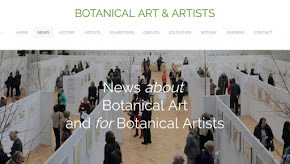 You can also follow my summary of the Calls for Entries for the various exhibitions of the national art societies in the UK on my blog PAGE UK Art Societies: Open Exhibitions. The New English Art Club is a group of around ninety professional painters whose work is based principally upon direct observation of nature and the human figure. We aim to foster excellence in all our activities and continue to assist and encourage the art of painting to develop even more expressive possibilities. 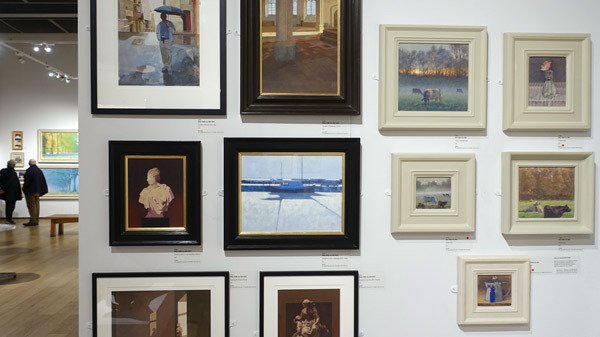 Our Annual Exhibition is a showcase for our members and gives aspiring artists an opportunity to be seen alongside some of the best figurative artists painting today. 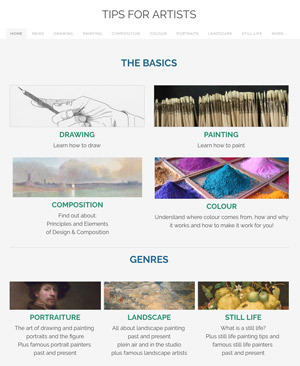 The NEAC website has also recently had a makeover since I last looked at it and is greatly improved. If you're thinking of entering the 2018 exhibition, I suggest you take a look at the numbers I crunched for last year's exhibition and my comments below. what the benefits are to those who seek to exhibit - in terms of the practical reality. 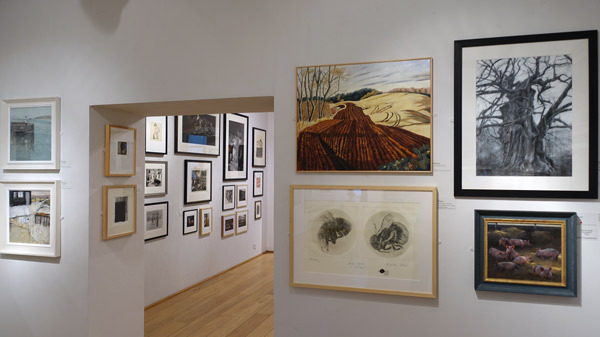 The organisation of the exhibition and the number of works being exhibited by non-members in recent times does not persuade me that the open entry is seriously seen as a route through to membership of NEAC. 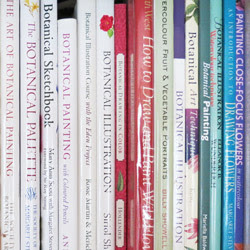 Candidates for membership need to be seen to be exhibiting more than one work - as they do in some of the other FBA Societies. (see the Artist Membership Application Process). Just two people were elected to membership in 2017. 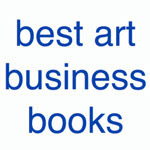 Both are established professional artists who were already members of other FBA Societies. One is the Treasurer of another society. It's also very clear that NEAC sees itself as a community of professional artists. Suggesting that the route to entry of NEAC is via another FBA Society and becoming an established and professional artist and NOT via this particular open submission..... Which may well come as a surprise to some people who have submitted in the past. Personally I'm also of the opinion that hanging just 25% of the exhibition from the open entry is not a great way to encourage people to enter. It makes it look like the open entry is being used to subsidise an exhibition which is overwhelmingly (75%) about members' works. Also hanging all the members work in the main galleries and most of the open submission in the North Gallery is somewhat pointed. Is this one exhibition or two? 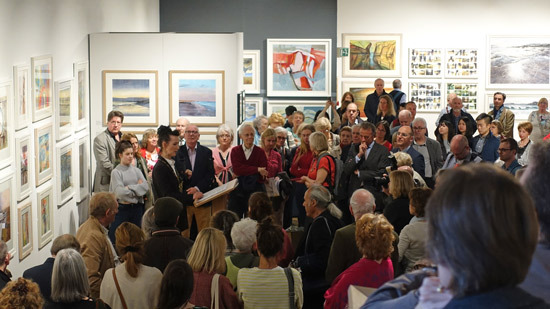 Frankly, in my opinion, the aim of an open exhibition should be to fund the majority of the cost of an exhibition by selecting artwork of merit - by whoever - that generates a healthy number of sales - OR charging a premium to members whose work does not sell. After all, let us not forget that art societies started out as a way of creating scale economies when putting on group exhibitions that enabled artists to raise their profile and have careers as a professional artist. Here's my summary of the metrics - the performance indicators - for the exhibition. 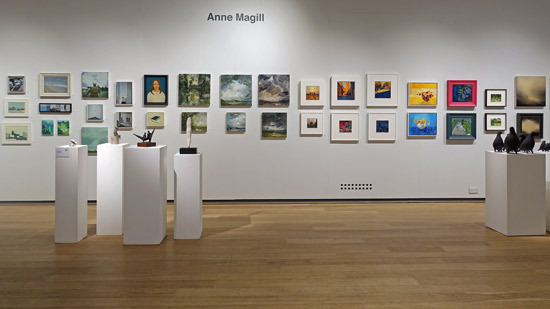 415 artworks were exhibited in the 2017 open exhibition - across all three galleries of the Mall Galleries. 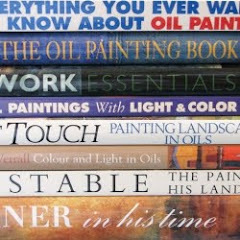 Paintings included oils, acrylic, watercolour and mixed media. Drawings included charcoal, pastel and graphite. 10 were members of other national societies (most of which are based at the Mall Galleries). The majority of the 84 non-member artists only had ONE WORK selected from the open entry for the exhibition, with a few having two works. Average number of works exhibited by non-member - 1.2 artworks. Most of the sales after four days of the exhibition had come from smaller works (see my review) - and not a lot appeared to be coming from members' works. [Note: By way of comparison, back in 2015 some 1,000 entries resulted in 94 paintings, drawings, prints and watercolours (i.e. 9.4%) were hung alongside the 293 works by members. Many artists are concerned about the cost of entering art competitions. Digital entry has totally eliminated the cost of framing and transporting work to London for all those who are unsuccessful in the first screening of their artwork. However, given that entry fee and framing costs escalate with the number of works entered, I'd suggest people think carefully about the number of works entered. Given that it's unlikely that more than one artwork will be selected and hung, I recommend that you consider entering no more than two works. It also seems unlikely a large work will be selected based on the 2017 exhibition - since most works by non-members were small or medium sized works. You also need to ensure you enter two works likely to be compatible with the artwork hung in an exhibition like this! (That's where reviewing artwork in person or online comes in!). You can review who won the prizes and awards in 2017 and whether these went to members (ie NEAC after their names) or open entrants. This is an OPEN EXHIBITION. Both members of NEAC and other artists are invited to submit artwork for consideration. Posted by Making A Mark on Monday, November 27, 2017 0 comments Who's linking to this post? Posted by Making A Mark on Sunday, November 26, 2017 1 comments Who's linking to this post? 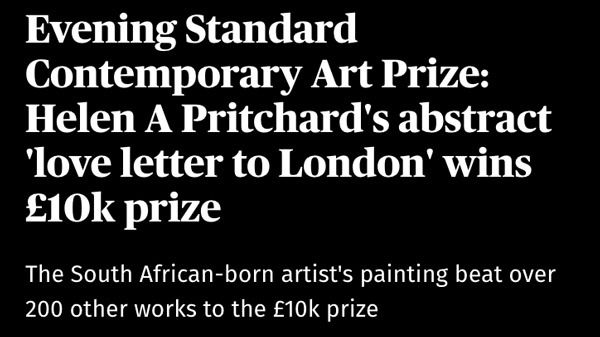 I'm not quite sure how I managed to miss the introduction, calls for entries and various videos about the NEW London Evening Standard Contemporary Art Prize - which offered a £10,000 prize for artwork about London. People introducing new art prizes generally write to me early on, especially if they offer £10,000 prizes as that's my basic threshold for taking art prizes seriously and writing about them. However, speaking personally, I only read the Evening Standard periodically and despite having various ways of picking up news about new art prizes I totally missed anything about it. Plus my many readers also tend to tell me about things they've read about or seen and also tell me about them and ask when I will be writing about them. However nobody wrote to me about it. So below is a summary of what my understanding is of what happened for those who might be interested should they repeat the exercise - which is unclear as I can't find any one website which provides information. Number of Entries - just 200! Before I start, I'd like to make the very important point that 200 entries - which is what they say they got - is about 10% of what I would expect for a serious art prize in the UK. Let's be very generous and call it 20% of the sort of size of entry art prizes with a serious first prize get. As a result I did lots of interrogations of Google to find references to the Call for Entries - and could find nothing other than the Evening Standard posts. I did find a reference to it on the Evening Standard Facebook Page for Reader Offers - but absolutely no comments on it. So I can only conclude that the marketing machinery didn't know WHO to contact to get coverage in terms of artists reading about this great opportunity. There are listings of people who get told about art competitions - I know I'm on it and I get told about lots - but draw a line in relation to what I will cover. I would have covered this one - if I'd ever been told about it! The Evening Standard is not enough to promote an art prize and get a serious entry! Bottom line if I was Hiscox, who were sponsoring the prize, I'd be pretty disappointed. a webpage for the London Evening Standard Contemporary Art Prize - which isn't a page with information. It's just a Topic Page on the Evening Standard website with lots of links to other URLs which focus on the pictures rather than what they are all about. 27 April 2017 - Evening Standard Contemporary Art Prize: Artists can win £10,000 for putting London on canvas (8 shares) - Note the number of shares! There are a few details about who can enter (open to UK residents aged 18 and over) and the prize - and then it says To find out more and enter the London Evening Standard Contemporary Art Prize, go to standard.co.uk/artprize - which takes is back to my first link above - which is sadly missing all the normal information for entering a prize e.g. like the deadline for entries! The only links which look remotely like they might lead to the information about how to enter lead back to the article above - which doesn't say a single word about "how to enter". Am I missing something? Have I found found out why there are so few entries? They will be given “London” as their brief and asked to submit a painting with the winning work, chosen from a shortlist, announced at an event at the National Gallery on October 26. 28 June 2017 - Evening Standard Contemporary Art Prize: Get inspired by these famous paintings of London - a very nice article highlighting a number of paintings of London done previously by artists at different times and in different styles. Still no sign of any details of how to enter. It finishes To find out more about the prize, which closes on September 24, go to standard.co.uk/artprize and guess which page we're back to! 5 July 2017- Evening Standard Contemporary Art Prize: Turner actor picks up his own paintbrush for our £10,000 prize - Not sure about the market segment analysis which informed this article - as in I'm not too sure this is the sort of marketing which is really going to engage with the professional artist and art student community! 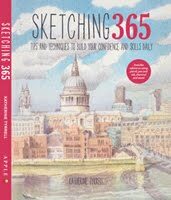 17 August 2017 - Evening Standard Contemporary Art Prize: Where to learn to paint in London - Great idea but it's a VERY incomplete list of places where people can learn to paint. Do these people KNOW where the art schools are in London? Again the link is back to the page with no information about how to enter. Has it been changed since the art competition closed? Did it ever have any information? Where did the people who entered get their information about what to do from? 22 September 2017 - Evening Standard Contemporary Art Prize: Your last chance to enter for £10k prize - It mentions the deadline is soon - finally I've found out something about the deadline and what you can enter 2 days before the deadline!!! If you’ll be putting the finishing touches to your work right until the final hour, make note that no entries will be considered after midnight this Sunday (September 24). 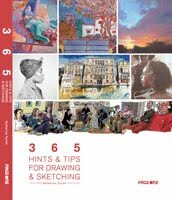 Entries cannot be bigger than 594 x 841 mm, and if shortlisted, need to be sent in for judging by October 16. I couldn't find any reference to any exhibition - so no opportunities for sales which are often an important incentive to artists entering art competitions. Wintery Waterloo Bridge by Christopher Green - who regularly produces hugely impressive and large scale ink drawings/paintings of London - and who won the £10,000 Lynn Painter-Stainer Prize this year. No prizes for guessing who I would have given the prize to! 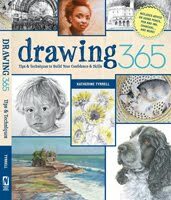 I've been featuring his artwork on this blog for years! Hand Car Wash, Salmon Lane by Doreen Fletcher who's probably the only artist other than Christopher who has produced a lot of paintings of London and about the East End - and I know the car wash in her painting as it's about a mile from where I live! 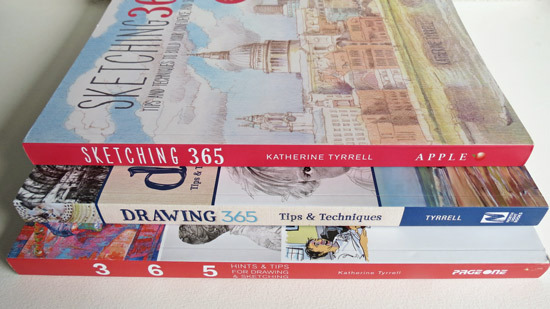 those running art schools or teaching art or art students in London re. whether you heard about this prize and/or encouraged people to enter. artists who did find out more about it - and where you found the information and what did it say. Posted by Making A Mark on Saturday, November 25, 2017 2 comments Who's linking to this post? Best wishes to all my American Readers who are celebrating Thanksgiving. They have a curious story. 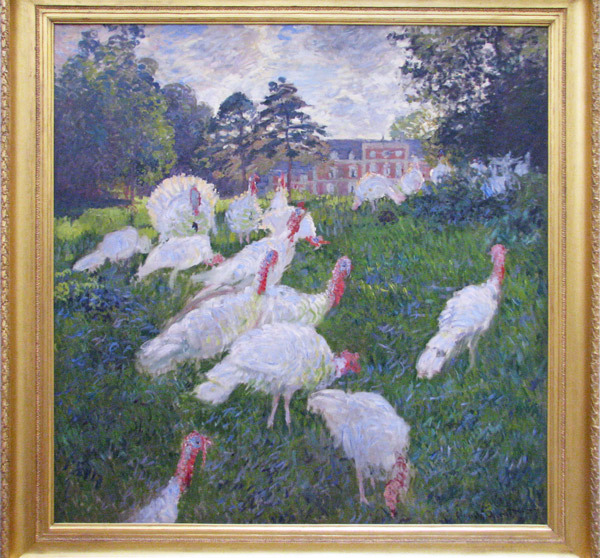 The turkeys - the Dindons - were painted by Monet in 1877 in the grounds of the Chateau of Rottenburg at Montgeron (just south of Paris) which was the home of Ernest Hoschedé, a wealthy department store magnate who was also an art collector and Monet's patron. this is the only painting I know in which Claude Monet painted birds. As it happens the same year that this painting was painted, Hoschedé went bankrupt and his wife Alice and their children moved in with the Monets at Vertheuil while Hoschedé continued to try and work in Paris and subsequently moved to Belgium. Monet's wife Camille had become ill with tuberculosis the previous year (1876). Then she gave birth to their second son in March 1878 - so having a second woman around may well have been a godsend. Camille subsequently died (of cancer) on 5 September 1879 at the age of thirty-two - and Alice Hoschedé then helped Monet to raise his two sons, Jean and Michel. Monet finally married Alice Hoschedé in 1892 after the death of her first husband. 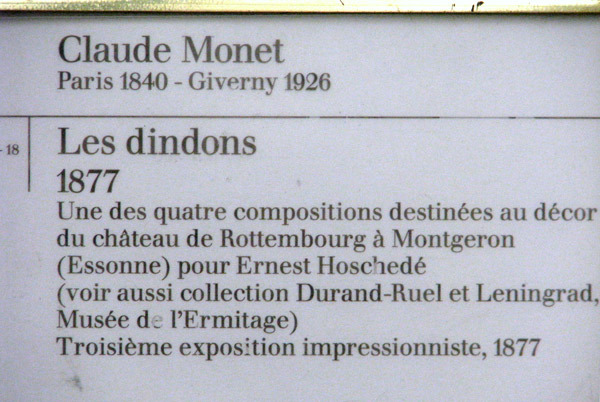 Alice died in 1911 and Monet in 1926. It's clear the painting was sold following the bankruptcy and the timeline of ownership is interesting. 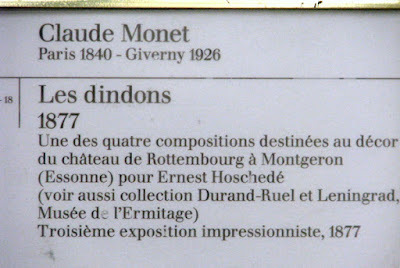 After its exhibition in 1877 it didn't get out much - until 1980 - after which it has been exhibited all over the world! Posted by Making A Mark on Thursday, November 23, 2017 1 comments Who's linking to this post? The 301st exhibition in 2018 will be held in March 2018 at the Mall Galleries - across all three galleries due to its size. It opens on Wednesday 21 March 2018 and closes at 2pm on Saturday 31 March 2018. The Private View will be on Tuesday 20 March 2018, 11am – 8pm. The RBA is a society where membership is often seen as a complement to membership of other national art societies. Indeed this was its original intention. This is a LARGE exhibition. 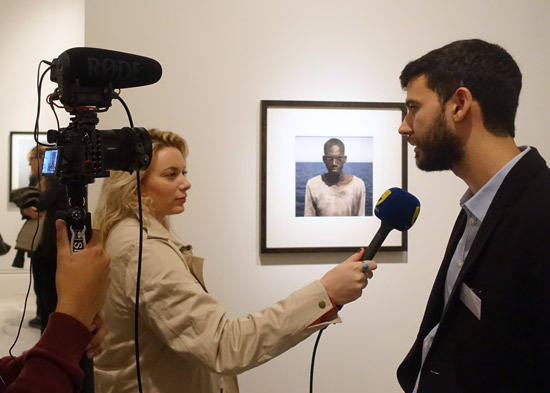 510 artworks were exhibited in 2017 in the open exhibition across the three galleries (i.e. 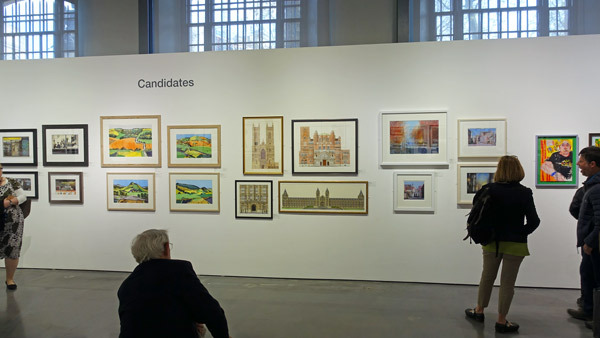 excluding the work by past Presidents and members, NADFAS RBA Scholars and the National Students At Exhibition). of the open artists,16 were members of other national societies (most of which are based at the Mall Galleries). Which leaves 84 which have no affiliation. 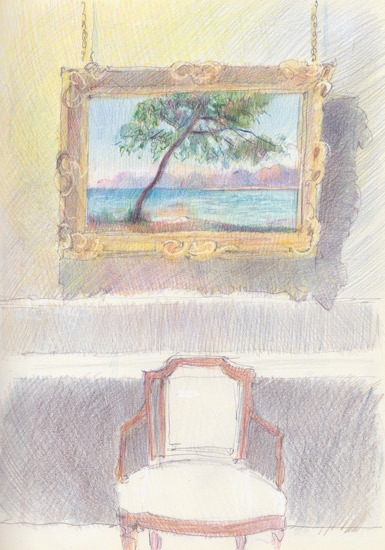 This is my blog post about the 300th Exhibition of the Royal Society of British Artists. You can review who won the prizes and awards in 2017 and whether these went to members (ie RBA after their names) or open entrants I've made the point previously that just 25% of the exhibition from the open entry is not great. From the perspective of the potential exhibitor it makes it look like the open entry is subsidising the exhibition - as opposed to a genuine effort to show good quality work from people who would like to be members in due course. After all the open entry is the future lifeblood of the RBA and the society needs to attract both good artwork and good artists who will be active supporters of the work of the RBA in future. In summary, this is an OPEN EXHIBITION. Both members of the RBA and other artists are invited to submit artwork for consideration. Any artist - over the age of 18 - living anywhere in the world can submit artwork to this exhibition. Posted by Making A Mark on Wednesday, November 22, 2017 0 comments Who's linking to this post? Posted by Making A Mark on Tuesday, November 21, 2017 0 comments Who's linking to this post? 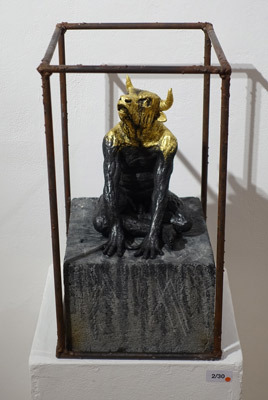 The ING Discerning Eye Exhibition is a show of six curated exhibitions of small works independently selected by six prominent figures from the art world: two artists, two collectors and two critics. 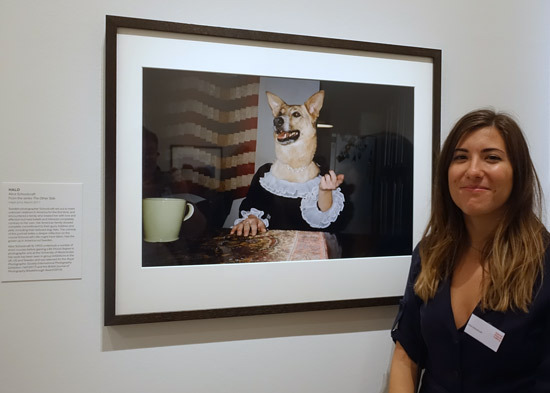 This is a review of the 2017 Exhibition which opened last week and continues until Sunday 26 November (10am and 5pm daily) at the Mall Galleries in London. It's taken a little longer than I had planned - I always forget how long this particular show takes to review properly - because there are lots of prizes and six completely different exhibitions! also read my past reviews and view the sort of artwork which has been selected in previous years - with the different sets of curators they have each year - see the archive of my posts dating back to 2008 at the end of this post. 75% of the artists and 55% of the works have come from the open submission. Typically if you see groups of work by the same artist in this exhibition it's a very good indication they have been "invited" to exhibit as opposed to "selected" from the open entry. This post covers the award winners and then reviews each of the six mini exhibitions in turn - with comments about different aspects of the show as a whole cropping up as and when! This year there has been some very sloppy labelling of artwork in the exhibition and on the website. It's such a privilege to get selected and then such a disappointment when winning a prize if the right prize is not identified either in the gallery and/or on the website. The numbers are there for a reason - to get it right. This is the list of prizewinners. Those that have numbers with an asterisk next to them were selected from the open submission. First, many thanks to the Discerning Eye for another lovely show and to Elmo Hood and Simon Tait for picking the pieces. There was such a good vibe there on PV night! Getting the prize was wonderfully encouraging. You have to harden yourself to a fair number of (kindly worded) rejections from open shows every year so it means an awful lot to get accepted and then the prize was an extra affirmation to keep on submitting! This year this was awarded to a painting by Rick Garland, one of the artists selected by Miranda Richardson. Posted by Making A Mark on Monday, November 20, 2017 1 comments Who's linking to this post? This is about a competition where the organisers and Jury allowed an entry which breached the rules to remain in the competition and win two prizes. One of the things I do when writing about art competitions is I aim to make the process more accessible for those wanting to enter and further their careers and/or achievements. I try to show those thinking about entering what the standard of work is in the exhibition - and the competition they're up against. I've had much praise over the years from people around the world for making that effort - which is NOT why I do it - but it's always nice to know that my efforts are appreciated. The third thing I do is the subject of this blog post. Basically, I speak up for those who may feel they maybe can't when things happen which really shouldn't happen in terms of the conduct of the competition. I don't like doing this - but I do think it's necessary. AND win not one but two prizes! Maija Tammi's project, One of Them Is a Human #1, is a series of photographs that places androids alongside one human, asking what it means to be alive. 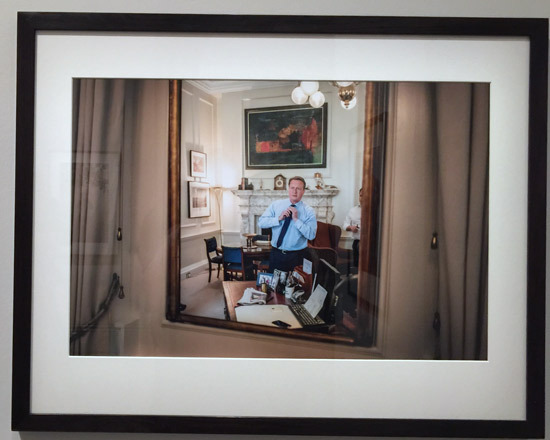 “The Gallery has decided not to disqualify this portrait though accepts it is in breach of the rules. The rules are reviewed every year and this issue will be taken into consideration for next year. 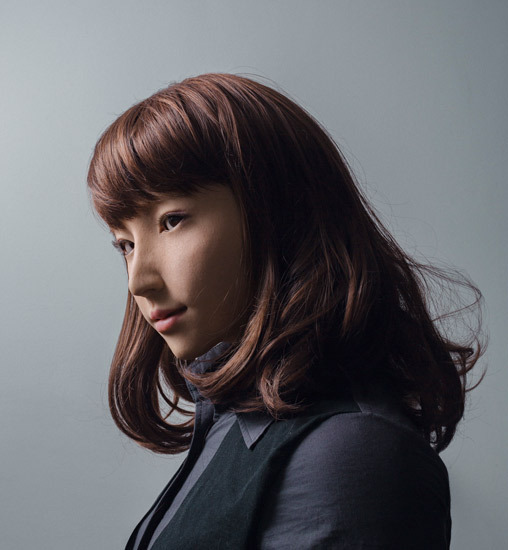 This portrait was part of 'One of Them Is a Human #1', a broader series which presents androids alongside one human. It was felt that the subject of this portrait, while not human, is a representation of a human figure and makes a powerful statement as a work of art in its questioning of what it is to be alive or human and asks challenging questions about portraiture. The ambiguity of this portrait makes it particularly compelling. the John Kobal New Work Award and a £5,000 prize for a photographer under 35. So a total of £7,000 (presumably in part funded by competition entry fees) was awarded for an entry which breached the rules and was ineligible for entry. I'll now go on to explain why, in my opinion, this should not have happened. Posted by Making A Mark on Thursday, November 16, 2017 6 comments Who's linking to this post? This post is for those who enjoy their art history and includes reference links to other more in-depth articles about the painting. 25⅞ x 18 in (65.7 x 45.7 cm). 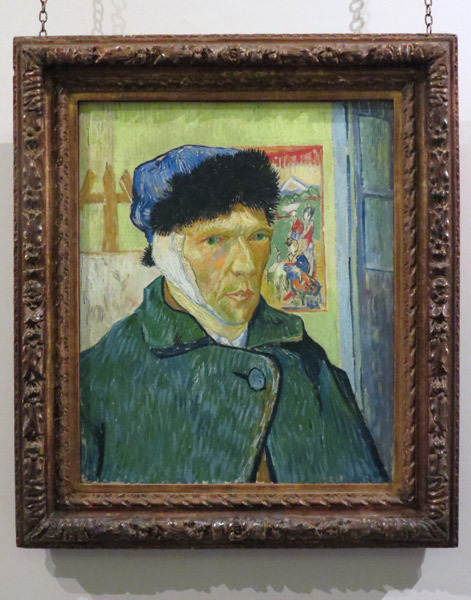 The final hammer price shattered the world record for a sale of an artwork at auction. 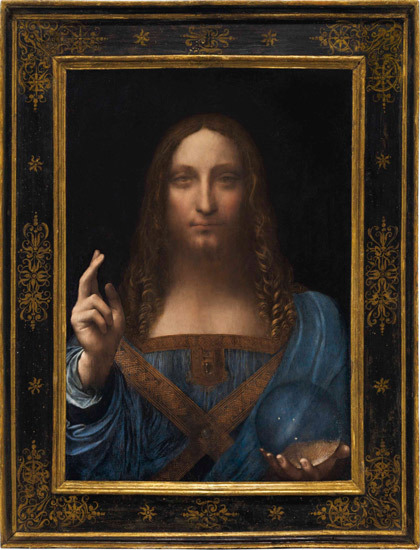 The painting sold for $400 million (at a cost of $450,312,500 to the buyer after you include the auction house premium). That equates to a cost to the buyer of £342,182,751. Almost 30,000 people viewed the painting as it was displayed to the public in The painting was show to the public in Hong Kong, London, San Francisco and New York. It's the very first time the painting has been shown to the public in Asia or the Americas. The bidding lasted 19 minutes with four bidders on the telephone and one in the room. The last bid jumped $30 million to close out the auction! Nobody knows who the successful bidder was. It's likely to remain in private hands. They made a film of people viewing the painting prior to the sale. Posted by Making A Mark on Thursday, November 16, 2017 0 comments Who's linking to this post? It's extremely gratifying that the two photographs of refugees won the first and second prize in the Taylor Wessing Photographic Competition 2017 over the photograph of the android which to my mind was technically in breach of the rules of the competition and should have been eliminated. I'm very much NOT a fan of competitions which change the rules after they have taken the money from those people who submit entries. It's just not fair or decent - and some might argue it's not legal either. the entry which won third prize and the reason why, in my opinion, this was a clear breach of the rules - and what needs to happen to prevent this happening again in a post tomorrow. The competition had 5,717 submissions from 2,423 photographers living in 66 countries. Those on the walls of the exhibition are as international as those submitting their photos for consideration by the jury. The jury considering the entries has nothing other than the title to go on. All entries are anonymous as both the name of the photographer and the person who is portrayed. This year for the first time those entering work were allowed to submit digital entries for the first sift which will have much reduced expenses in relation to postage and packing for those living overseas. It also means that the jury can spend longer on those that make it through to the second sift. 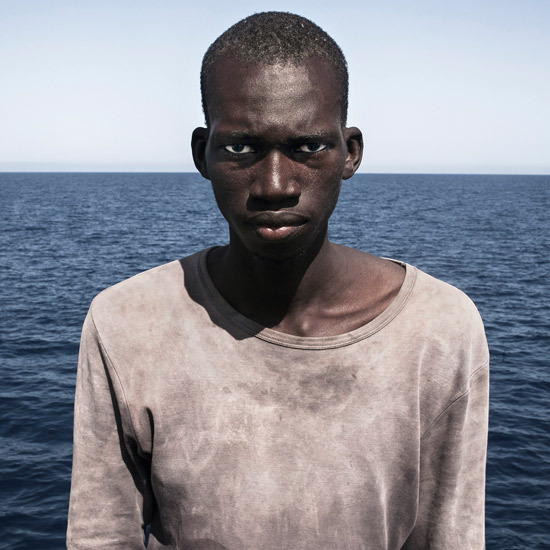 The £15,000 prize went to César Dezfuli for his photograph of 16 year old Amadou Sumalia from Mali. He was later transferred to a reception centre in Italy. It comes from his series of photos called "Passengers". This documented in 118 photographs (click the link to see other photographs in the series) about the migrants on a boat who came from Mali, Gambia, Guinea, Nigeria, Senegal and Sierra Leone. Most will have been economic migrants fleeing poverty. It was taken very shortly after Amadou had been rescued from the Mediterranean, 20 miles off the Libyan coast along with 100+ other men. When compared with the rest of the photographs taken it's clear why this one was selected for this competition. Education: graduated in journalism and audio-visual communication from the Universidad Rey Juan Carlos, Madrid, Spain followed by a postgraduate qualification in photojournalism. His work documenting human rights issues has been published in numerous magazines and has been seen in group exhibitions in 2017 including First Prize in the Head On Photo Festival 2017 Portrait Category, and awards at the International Photographer of the Year Awards and the Moscow Foto Awards. César told me that he'd been working on a freelance basis, following a project to rescue people who were at risk in the Mediterranean as they try to reach Europe. Against the balance and precision of Dezfuli’s composition, the directness of Sumaila’s gaze is striking and unsettling. The portrait powerfully conveys his loss, solitude and determination. My comments: It's much smaller than I imagined but amazingly arresting. 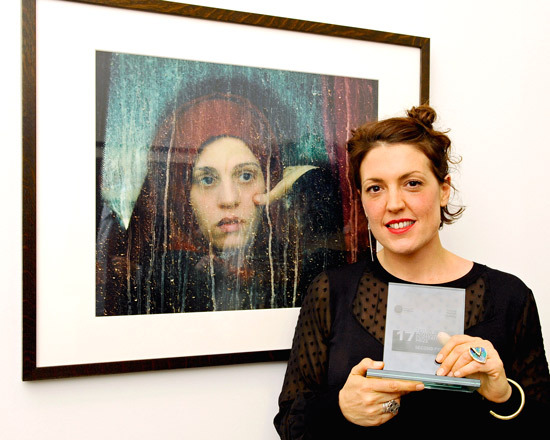 Abbie Trayler-Smith won the £3,000 Second Prize. Abbie is a Documentary and Portrait Photographer who was working on an assignment for Oxfam when she took the photograph. She was at the Hasan Sham camp for internally displaced people in northern Iraq when a convoy of buses had just arrived, bringing people to safety from the intense fighting in Mosul. Abbie told me that the woman is now in Baghdad with her husband. Her family have returned to Mosul but her sister had both her legs blown off when their home was bombed in Mosul. The colour and texture of the portrait has a painterly quality, created by the mud-streaked glass through which the young woman is framed. Her haunting expression quietly suggests the unimaginable horrors of life under occupation. My comments: I really liked this photo and hoped it would do well. The drips on the window of the bus seem to act as a metaphor for the situation at some many different levels. Also while she is undoubtedly traumatised by her situation, there seemed to me to be a certain element of curiosity about what lay out the window which comes from being moved from where you have lived all your life. Is it going to be any better? 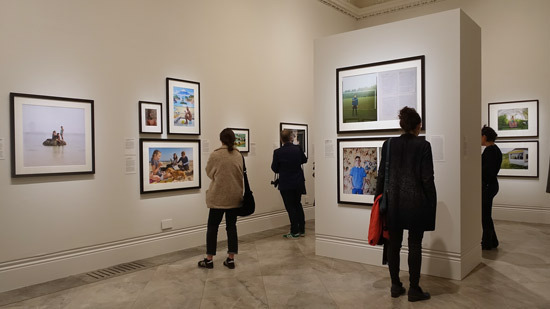 One of the interesting things about the exhibition is how it has changed since both the Director of the NPG and the Curator of Photography have changed (following their respective retirements). One of the first notes I made was "no twins and no gingers". I think I'd begun to assume these were perennial features of photographic competitions - but obviously not. There's a very powerful wall about the America of 2016/17 which was excellent which I am now euphemistically referring to as the "portrait of America". The two photos either end of the left hand wall are of the "wall" between Mexico and the USA. Inbetween are photographs of the American election. On the right are two photographs of individuals with iconic emblems of the 'real American'. 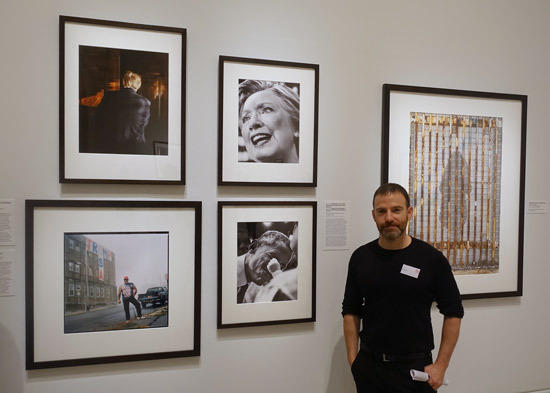 Alan Mozes followed the campaign trail for two months at the end for Vanity Fair and his portraits of both Clinton and Obama made the cut. 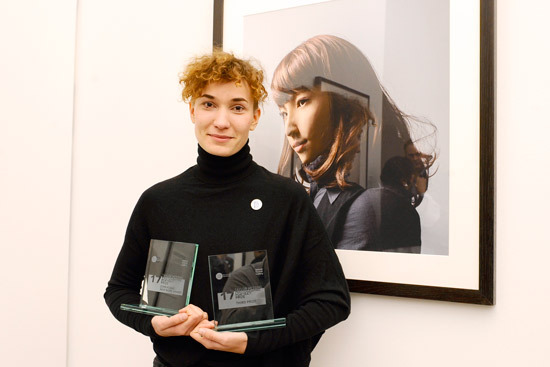 Alice Schoolcraft graduated in 2016 with a Bachelor of Arts in Photographic Arts with First Class Honours at the University of Westminster in London. She is half Swedish and half American and went to stay with her (never met before) American family and found that their values and activities were very different from those she has been brought up with. She photographed some of the curious things they got up to and called the series The Other Side. 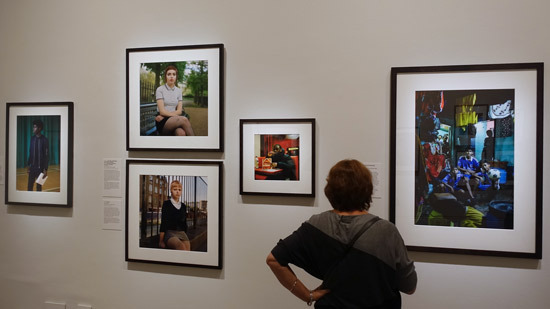 Curiosity about people’s personal lives is a driving force in my work and by employing detailed study I want to provide the viewer with the feeling that they know the people in my photographs personally without ever having met them. There are also very few celebrities this year - of the bling variety. 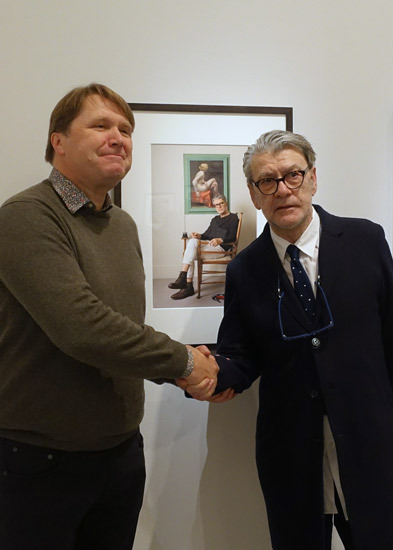 Instead we have artists as subjects - Jack Vettriano (who was at the preview this morning), Maggi Hambling and AA Gill who has subsequently died. Plus one of David Cameron looking fairly harassed a few days before the Referendum result - and his resignation. 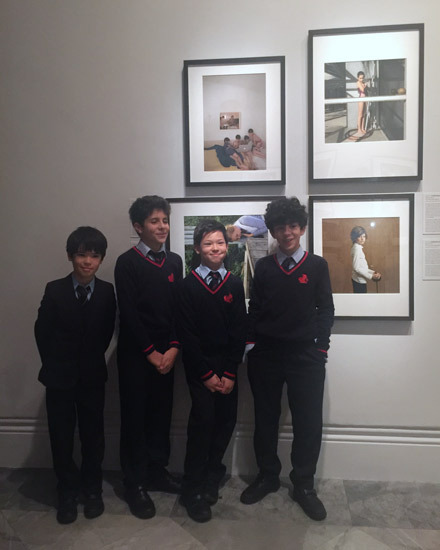 Young people and what they get up seemed to be a recurrent theme of this year's exhibition. The exhibition also felt rather more international than it has hitherto. Posted by Making A Mark on Wednesday, November 15, 2017 1 comments Who's linking to this post?